I am always grateful for friends who pander to my love for food and cooking. I remember there was one Christmas where I received 1 bottle of Italian olive oil, 3 bottles of flavoured French olive oil, and 1 bottle of Israeli olive oil. I’m not sure why these friends felt that I was desperately in need of olive oil but I was certainly good in terms of supply for the whole year. 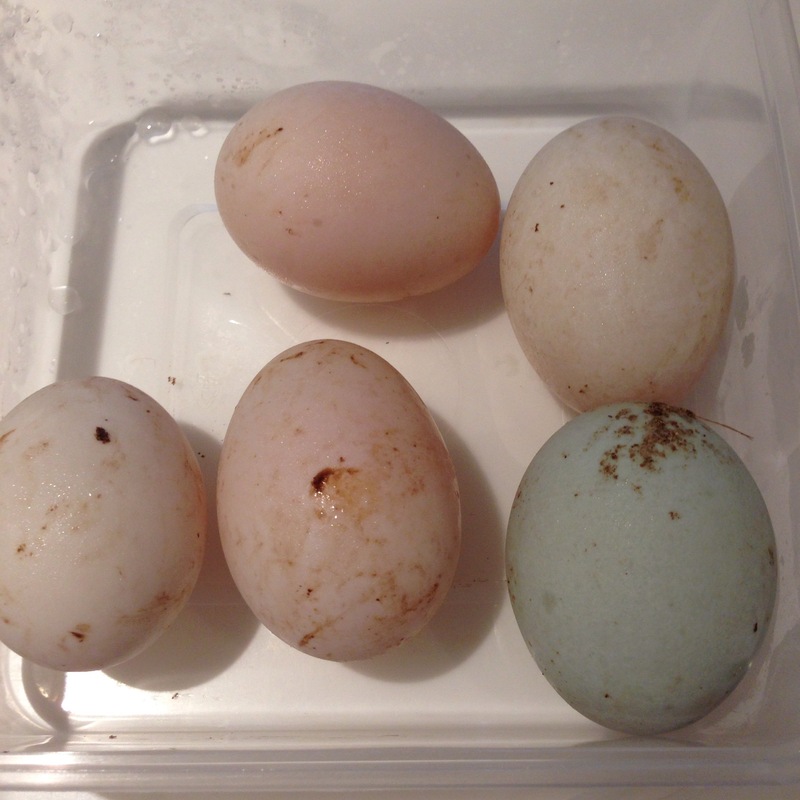 This week a good friend had come back from Bangkok and dropped off some duck eggs for me. For some reason, fresh duck eggs are not available in Singapore, and I spent a good while admiring how pretty the shells looked as there were 3 distinct colours for the eggs. Some may wonder why I am getting excited over fresh duck eggs. Salted duck eggs are aplenty in Singapore and indeed I do have a bunch on hand to try out a recipe for salted egg squid, but there is a certain novelty to duck eggs that ought to be showcased. I was a little torn between making duck eggs Benedict or duck eggs en cocotte but I felt a little too lazy to make the hollandaise sauce. So at least my morning teetered on to a happier start – it was surprisingly cool this morning, probably because of gathering rain clouds, and it was the ideal setting for a baked egg breakfast. 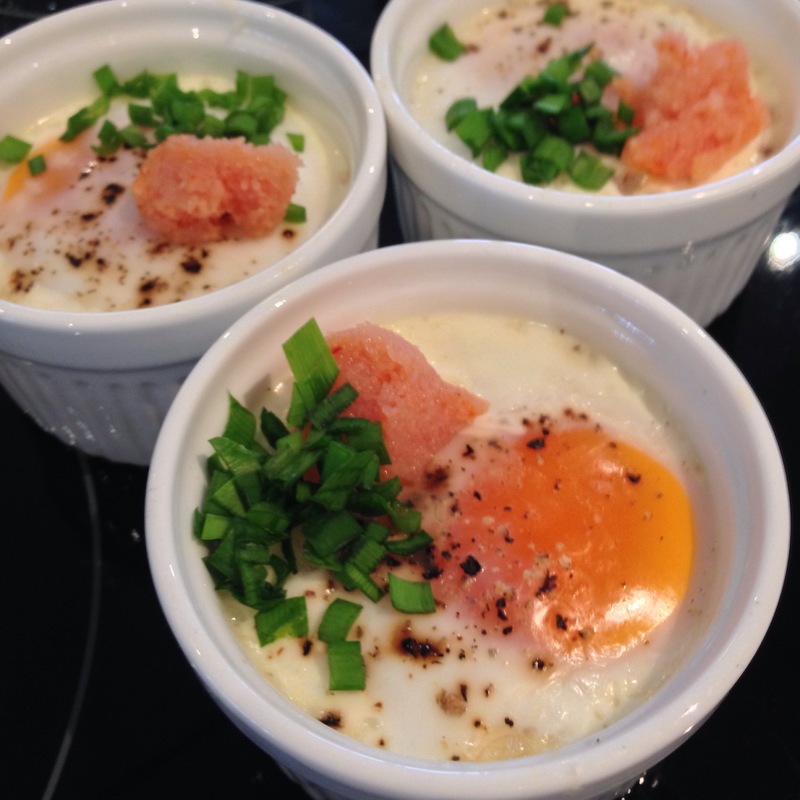 Eggs En Cocotte is a truly simple dish that I thought would showcase the richer and slightly gamey flavoured duck eggs. I happened to have mentaiko roe in the fridge, which is a marinated cod or pollack roe usually featured in Japanese cuisine. I thought that the salty spiciness of the mentaiko along with freshly grated Parmesan cheese would perfectly pair this baked egg dish. And it did. This is eggy umami-ness at its best. 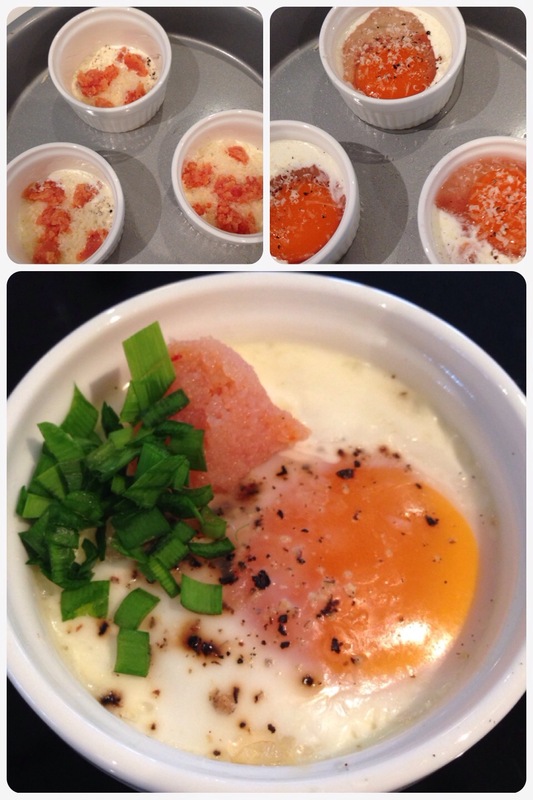 Top left going clockwise: fill base of ramekin with cream and tiny dollops of mentaiko and shavings of cheese; top with egg; bake to perfection and top with a little fresh mentaiko and chives to serve. Put ramekin into a baking tray. Pour the cream into the base of the ramekin. Carefully drop tiny clumps of mentaiko roe on the cream, making sure the clumps are well distributed. You will need about 1 tsp of mentaiko for this. 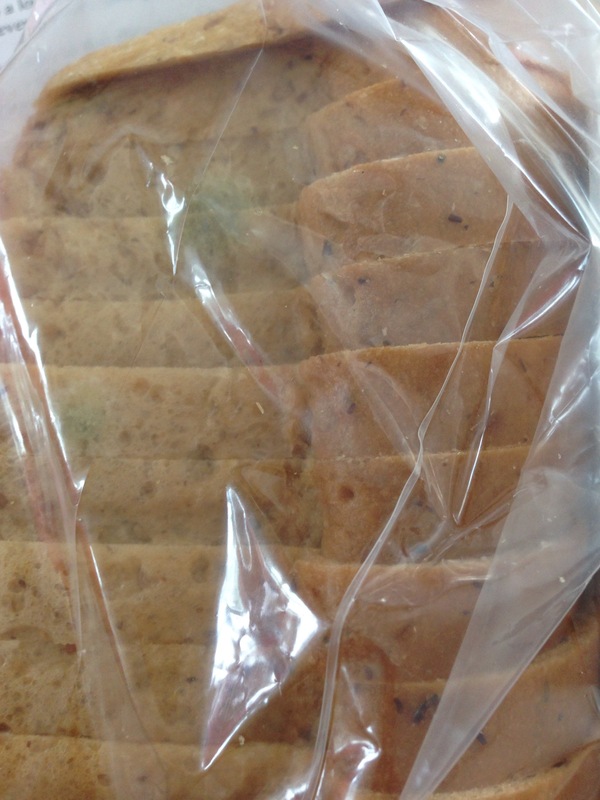 Reserve 1/2 tsp for topping later. Break the egg and gently slide it on top of the cream, mentaiko and cheese layer. Grate a few shavings of Parmesan cheese over the top of the egg, and another tiny bit of salt and pepper. Pour hot water into the baking tray till the water level comes halfway up the sides of the ramekin. Remove ramekin from oven and the water bath. Top with 1/2 tsp mentaiko, some chopped chives, and serve hot.